In olden times, bathan was common to all places of Bengal wherever a rural settlement emerged. One who was unable to tend his cattle by himself or herself surrendered their cattle to a bathan establishment where it grew under the care of its custodian, bathania. With the growth of population and practice of intensive cultivation and consequent scarcity of grazing grounds, the bathan institution has been shrinking from early nineteenth century. The khas or public land was normally used as sites of bathans. But as the quantity of khas land diminished over time, the system of maintaining cattle on khas land as a mode of production also declined. Bathan, however, is still noticeable in some zones in Bangladesh, such as, haor basin, newly formed chars and offshore islands. In Sylhet, Habiganj, Netrokona and Kishoreganj, temporary bathan settlements are formed in the winter in the haor beds. The settlements are dismantled when the monsoon comes. 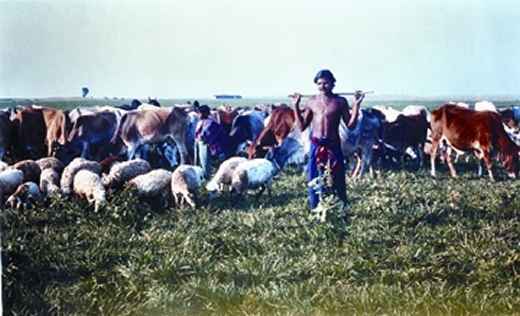 The cattle of the haor villages where fodder is scarce or absent during monsoon is usually transported to new bathans established in the hilly areas where grasses and leaves grow in the rainy season. There are also some bathans in chalan beel areas of Pabna and Sirajganj district. Most present milk product industries are now located near bathans or modern dairy farms.